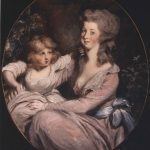 Born Anna Warner on October 11, 1758, in Groton, Connecticut, she was orphaned at an early age, and went to live with her Grandmother Mills on a farm at Candlewood Hill, where she helped her uncle, Edward Mills, with the crops and animals. She was unusually tall and strong for a girl. When the American Revolution began, Anna longed to fight the despised Tories. During the Revolutionary War, New London harbor on the Thames River was home port for many privately owned armed ships that preyed upon British supply vessels and merchant ships. The privateers were licensed by the State of Connecticut according to the rules established by Congress. Each year they increased in number and captured more British shipping. Their exploits peaked with the taking of the Hannah by the Minerva in the summer of 1781. Seizure of the Hannah’s rich cargo, which included personal supplies for the British officers stationed in New York City, helped prompt the events that followed. New London’s bulging warehouses brought great wealth to adventurous ship owners and merchants, but they were a potential target for enemy reprisal. From the earliest days of the Revolutionary War, state officials had seen the need for fortifications, but construction proceeded slowly. 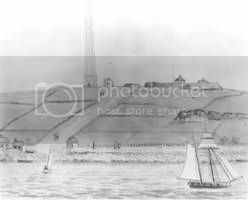 By 1781, the largest structure on the New London side of the harbor, Fort Trumbull, was still unfinished and vulnerable to attack from land. But on the eastern side of the river on Groton Heights, Fort Griswold commanded the harbor and the surrounding countryside. Named after then Deputy Governor Matthew Griswold, the fort played a key role in the early stages of the Revolutionary War by defending the port of New London, a supply center for the new Continental Army. The fort was somewhat square with projecting fortifications on two corners and a projection on the east side, and a deep trench surrounded the fort on three sides. The lower walls were faced with stone and were topped with a barrier of cedar pickets projecting outward. Above this was an earthen wall with openings (embrasures) for cannon. A tunnel-like passageway (sally port) led to a covered ditch, which ended at a battery for cannon southwest of the fort. A V-shaped earthen mound protected the gate at the north end. Barracks for 300 men paralleled the innermost wall and the magazine was set into the southwest bastion near the flagpole. The fort was in good condition and the magazine was full in late summer 1781. The British generals were anxious to distract General George Washington, who was then marching south. They decided to create a diversion by attacking the supply center at New London, and with the same action destroy the Rebel pirate ships. 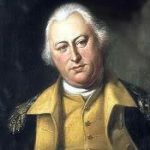 The command of the expedition fell to the traitor Benedict Arnold, who had deserted the American cause the year before, and who was a native of nearby Norwich, and knew the area well. Fort Griswold had a key strategic position above the Thames River, but the British knew the fort’s inner workings thanks to Arnold. At sunrise on September 6, 1781, the townspeople were awakened with the news that a large force of British Regulars had landed on both sides of the harbor and were coming upon them fast. They could do nothing but flee. The fleet had sailed from Long Island the evening before – New York was still controlled by the British. Only a sudden shift in the wind prevented a surprise night attack – it was 9 am before the transports could come close enough to shore to land the troops near Groton. Arnold approached the harbor from such an angle that Fort Griswold’s gun positions could never draw an effective shot on the British fleet. A number of rigged ships in the harbor caught a favorable breeze and escaped upstream, but the rest were trapped. An 800-man detachment led by Benedict Arnold into New London met only scattered resistance as they set about the task of destroying the stockpile of goods and naval stores kept there. He was unaware of the orders given to spare most of the town, or that one of the ships they were to destroy was filled with gunpowder. The ship burst into flames and created an uncontrollable fire, burning 143 buildings that should have been spared. Tangled woods and swamps slowed the British force that landed on the east side of the Thames River. A battalion of New Jersey loyalists responsible for moving the artillery couldn’t keep pace with the Regulars, who came within striking distance of Fort Griswold at 10 am. Meanwhile, the fort had been garrisoned with about 150 colonial militia and local men under the command of Colonel William Ledyard. Colonel Ledyard and his officers, expecting reinforcements momentarily, elected to defend the post against the superior force. Colonel Eyre, the British commander, sent forward a flag demanding surrender. Ledyard refused. The demand was made again, and Eyre threatened that if he were forced to storm the fort, no quarter would be given to its defenders. The response was the same, and the British force advanced on Fort Griswold. As they neared the ditch, they were met with an artillery barrage that killed and wounded many, but the seasoned and disciplined troops continued their charge. Some tried to gain the southwest bastion of the fort, but they were repulsed, and Colonel Eyre was badly wounded. Under heavy musket fire, another group dislodged some pickets and by hand to hand combat reached a cannon and turned it against the garrison. Another party led by Major Montgomery charged with fixed bayonets. They were met with long spears, and the major was killed. A few of the Regulars managed to reach the gate and open it, and the enemy force marched in. American and British accounts differ as to what happened next. The American version holds that after Ledyard gave up his sword in surrender, he was immediately killed with it, and a massacre ensued. When it was over, more than eighty of the garrison lay dead and mutilated, and more than half of the remainder were severely wounded. The British version makes no mention of the massacre or the manner of Ledyard’s death. The entire battle had lasted only forty minutes. Arnold only commanded a raiding party, not a conquering force, so as evening approached Fort Griswold was abandoned. He left a detachment behind to lay a powder trail from the full magazine of gunpowder to the barracks, and then to burn the barracks. This attempt to destroy the fort failed when a patriot put out the fire before it could reach the explosives. Arnold reported his losses for the expedition at 51 dead and 142 wounded. Major Montgomery was buried in the fort’s parade ground. The other British dead were placed in unmarked graves, and their wounded were carried down the steep hill to the river. The American wounded were placed on a heavy artillery cart, which smashed into a tree, causing terrible suffering. The bleeding wounded men were then carried to the nearby Avery house. In 1830 a granite monument was dedicated to the men who had defended Fort Griswold during the Battle of Groton Heights. In the centennial anniversary in 1881, the top was enclosed and the monument was increased to a height of 134 feet. It has become the town’s symbol and is now featured on the Groton town seal. When the British attacked Fort Griswold, Anna’s uncle Edward, a corporal in the militia, had hurried to fort, leaving behind his wife, a young son, and a new baby. All day, the cannons rumbled, and smoke rose from the battle and the burning town. By nightfall, the guns were silent, but Uncle Edward failed to return home, and there was no news. At dawn, Anna rose, milked the cows, and began the three-mile trip to the battlefield in search of her uncle. She hurried down the lane to the highway that was already crowded with worried relatives. Anna finally found Edward lying mortally wounded in the Avery house, weak from the loss of blood and fading fast. He longed to see his family and begged his niece to bring them to him. Anna hurried back to the farm, saddled the old horse, helped up her aunt and older the child, carried the infant herself on foot, and placed the baby in the arms of the dying patriot. Anna married Elijah Bailey, a veteran soldier and postmaster of Groton, in 1783. In 1800, they established an inn on Thames Street below the fort, and Anna’s hearty manner and outspoken ways made the tavern popular from the start. When President James Madison declared war on England in 1812, Anna’s hatred for the British was rekindled. Her vigorous denunciation of the British attracted many in her inn. During the war, a number of naval engagements in New England coastal waters kept people in the port towns in an almost continuous state of watchful agitation. This was especially true in the Groton-New London area, where there were many still living who remembered those terrible days of September, 1781. When the fleet scuttled into New London harbor in June 1813, everyone believed the British would attack again. The people fled to the back country. Anna sent away her household goods and was preparing to follow. Meanwhile, up at Fort Griswold, the men who were feverishly preparing the ancient cannons for action discovered a problem – unless a lot more flannel cloth that was used as wadding to load the cannon could be found immediately, the guns would be useless. A search party was sent to scour Groton for any kind of fabric that could be used for wadding. One of the soldiers found Mother Bailey, as she was then known, still at home. As soon as they explained their mission, she loosened her long flannel petticoat, stepped out of it, and presented it with a wish that the wadding would do its work well. Amused, bystanders saluted the daring gesture, for in 1813 ladies didn’t admit to wearing petticoats, much less remove them publicly. The messenger carried his prize to the fort, where it was received with cheers. Though the British decided not to attack, word of Mother Bailey’s impulsive gift spread over the country. Newspapers hailed her as the war’s greatest female patriot. After several days of sailing about menacingly in Long Island Sound, the British ships apparently thought better of entering the harbor and dropped from view. Over the years, no politician, from selectman to President, could pass through Groton without paying his respects to the intrepid matron: President James Monroe, General Lafayette, and President Andrew Jackson, who presented an iron fence for the west side of her house as a token of appreciation. As her fame increased, visitors flocked to the tavern to hear the lively tale told from her own lips. Anna Warner Bailey died in Groton, Connecticut, on January 19, 1851, and was buried in Starr Cemetery there.